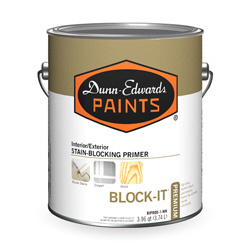 Superior hiding, stain-blocking primer seals in tough stains. 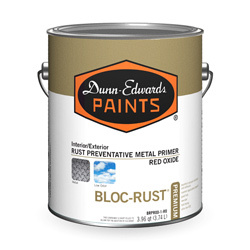 BLOCK-IT® Premium is a high-hiding, ultra-low VOC waterborne alkyd primer for use on a variety of previously painted or new interior and exterior surfaces. 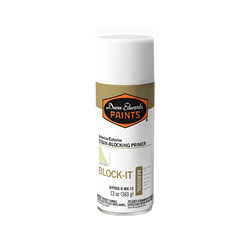 BLOCK-IT® Premium is excellent for blocking stains from food and grease, water or smoke damage, ballpoint or felt pen ink, lipstick, crayon, and tannin from woods such as cedar or redwood. Its innovative formulation also provides excellent adhesion and enamel holdout, good sandability, low odor, and superior flow-and-leveling for easy brush and roller application. 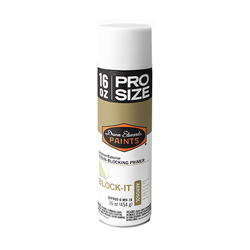 BLOCK-IT® Premium uses waterborne alkyd resins, barrier-type pigments and stain-blocking additives that form a smooth, tight film over the stain, locking it in place and preventing it from migrating through the topcoat. In laboratory tests, BLOCK-IT® Premium outshines the competition in blocking out a variety of stains, including washable marker, lipstick and ballpoint pen ink. Comparison panels were created with one coat of primer and a topcoat of SUPREMA® Interior Flat paint (SPMA10). These are high-resolution scans of the actual test results. The actual test results may be viewed by appointment at Dunn-Edwards corporate office.